We at Rattan Enterprises manufacture Pulse Jet Filter BagsÂfrom best quality non-woven needle felt material, which brings high strength and performance. 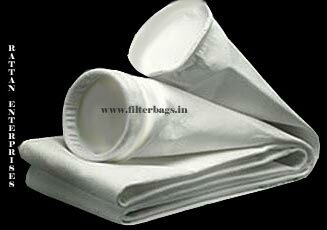 Best filter media is needed for optimal filtration to operate a bag house at increased air to cloth ratio. From environment operating at ambient temperature to high temperature with corrosive gases, we work with all clients to engineer a felt media best suitable for the application. These Pulse Jet Filter Bags are manufactured at our modern manufacturing unit equipped with sophisticated infrastructure, which includes unique three needle Japanese chain stitch machines and other precise functional imported machines.